From left, Savannah Chapman, 3, her mom, Jennifer Chapman and Kamry Chapman, who will turn 2 on Thursday, work on a craft Tuesday during Storytime at the Galion Public Library. 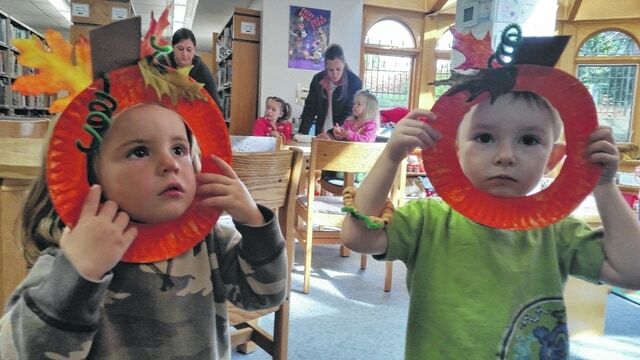 From left, Cameron Fortney, 2, of Galion, and Thomas Crothers, 2. also of Galion, pose during Storytime Tuesday at the Galion Public Library. http://aimmedianetwork.com/wp-content/uploads/sites/38/2015/10/web1_Story.time_.Two_1.jpgFrom left, Savannah Chapman, 3, her mom, Jennifer Chapman and Kamry Chapman, who will turn 2 on Thursday, work on a craft Tuesday during Storytime at the Galion Public Library. http://aimmedianetwork.com/wp-content/uploads/sites/38/2015/10/web1_Story.Time_1.jpgFrom left, Cameron Fortney, 2, of Galion, and Thomas Crothers, 2. also of Galion, pose during Storytime Tuesday at the Galion Public Library.